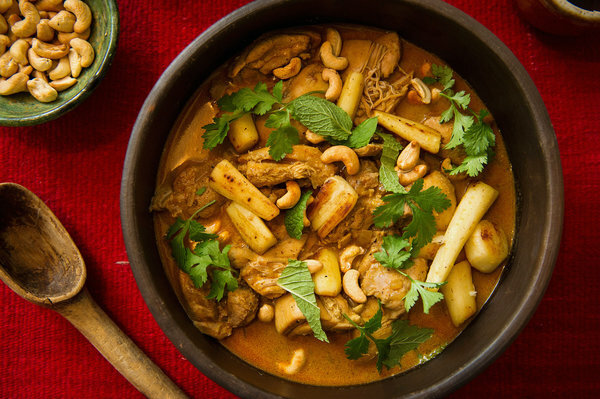 Here’s a nice bunch of curry ideas from various cultures. I’m taken with the maple one, though since fenugreek, a curry powder ingredient, is used for artificial maple flavor, it’s probably not as unusual as it sounds. Here’s one of the “recipes”, (and I use the term guardedly). Wow, that’s quite the goof! Sleuthing back via the link at the bottom of the page, I found this: http://www.nytimes.com/interactive/2013/01/06/magazine/potato-recipes.html#Curried_in_Coconut_Milk. It seems to refer back to yet another recipe but at least there are measurements in this version. Editing/proofreading are not what they used to be. Yesty I watched a 2013 Martha Bakes, where I was confused when she added fresh thyme to cracker dough twice. She also said to form rectangles, but did’t say what dimensions. So I googled the recipe, which corrected the thyme but was still fuzzy on the directions. I’m able to figure it out, but distressed that so many printed and online recipes are incomplete/incorrect.